QualiChem manufactures private label products specifically designed for the treatment of low, medium, and high-pressure boilers. When you work with us, you can expect world class manufacturing, expert support, and the resources required to help your business grow. Below is an overview of products available to private label sales and service companies. Please contact us if you seek a product not covered in this overview. We will be happy to help meet your needs. 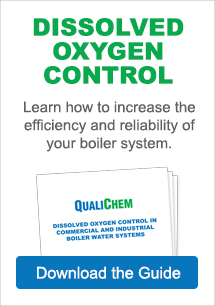 Oxygen scavengers do just what the name implies — they help reduce the amount of dissolved oxygen in a boiler system. Different boiler systems require different kinds of chemical scavengers: either volatile, non-volatile, organic, or inorganic, depending on makeup water quality, system pressure and temperatures as well as equipment design. Boiler water is typically first treated externally, by removing contaminants before they enter the boiler. This external treatment is accomplished through filtration, softening, demineralization, etc. Further treatment of the boiler water is required to keep boilers operating at peak efficiency and minimize corrosion, pitting, and scaling. This treatment is referred to as internal treatment. Chemistries used to accomplish this utilize a variety of treatment methods such as precipitation, sequestering, solubilizing. The majority of carbon dioxide contamination in boiler systems is formed by the breakdown of carbonate and bicarbonate alkalinity. When carbon dioxide is formed, it gets distributed throughout the entire plant steam system. As the steam is used and begins to condense, carbonic acid is formed. The resultant acid formation and low pH will corrode condensate piping and requires chemical treatment to prevent corrosion. The use of Neutralizing and Filming Amines can help address carbonic acid attack. Deposits are the buildup of unwanted contaminates inside a boiler. A deposit of only 1/16 of an inch of scale can reduce your boiler efficiency by up to 20%. Boiler cleanup products are used to help remove deposits from the feedwater, boiler and condensate systems. Clean boilers help improve efficiency and reduce water, chemical and energy usage costs. Ion Exchange resins become fouled over time. Use of resin cleaners help keep the softener, dealkalizer or demineralizer resins free of foulants for improved run-lengths. This helps prolong the effective life of the ion exchange resins reducing regenerant usage and costs. To learn more about QualiChem's selection of boiler treatment products please contact us. We look forward to hearing from you and helping you determine which product selection is best for your application.